Horn Book is giving DINOTHESAURUS a nice review. 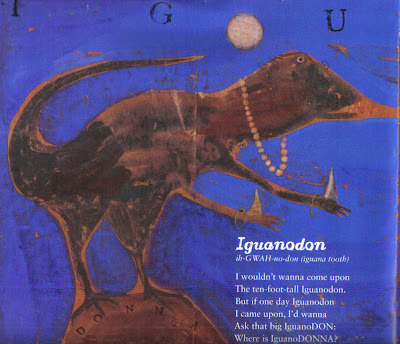 But first another sneak preview, this time Iguanodon, pictured in a detail above. Now, here's the nice review from Horn Book. It's terribly easy to make mistakes in regards to dinosaurs. There are two in this review: A plesiosaur, not "Plesiorus," was a prehistoric sea reptile, and a pterosaur, not "Pterosaurus," was a prehistoric flying reptile. Also the letter "B" in the word DUMB is printed in reverse in the book, but I imagine that's difficult if not impossible to do in a review. In any event I enjoyed this, especially mention of the word "genius." Beginning by defining “The Age of Dinosaurs” (“The dinosaurs / First lived outdoors / During the time Triassic”) and ending with their demise (“What made the dinosaurs die out? / Why don’t they still parade about?”), Florian rounds up all the usual prehistoric suspects (Brachiosaurus, Iguanodon, Triceratops) and adds a few outliers (the sea reptile Plesiorus, the flying reptile Pterosaurus) and lesser knowns (Minmi, Troodon). The twenty resultant verses are characterized by wordplay, mixed-media illustrations, and a scientific fact or two, emphasizing Florian’s genius for fusing sophisticated language, image, and science in ways both accessible and appealing. On Tyrannosaurus rex: “Its jaws were horrific. / Its profile distinct. / I find it terrific / That it’s T-rex-tinct.” And poor Stegosaurus: “Its brain was smaller than a plum. / Stegosaurus was quite DUMB.” In a link to the titular thesaurus, Florian fills a gray gouache Stegosaurus with a grid of rubberstamped synonyms (daft, dazed, witless, slow, thick, dunce). Seismosaurus, depicted as large enough to contain collages of sailing ships, may have been, as the appended “Glossarysaurus” tells us, the longest dinosaur that ever lived. Also appended is a list of dinosaur museums and fossil sites, a selected bibliography, and suggestions for further reading. b.c. My spies tell me you just got married!!! What a wonderful review! I love your sneak peeks! It's DINOmite! How great to get such a lovely review! I'm excited you have a new one coming out... I'm a big fan and my 5 year old son is getting interested in dinos :) Happy weekend! No one has done the behemoths prouder, Douglas. Keep 'em coming. I found this amusing, and in a curious way, charming. Ooh - I love being sneaky. And getting a sneak peek at both the poem and the review. Bravo! And Shabbat shalom! I can't wait to hold this book in my hands and share it with my students! Thanks for another peek inside DINOTHESAURUS. Looking forward to the book's publication. I have little doubt that the book will be a big hit with children...and children's poetry lovers like me. Thank you Pat, Dave, Kelly. and Mary Lee. Excellent--congratulations, Douglas! Hard NOT to be pleased with any review containing "genius," "sophisticated," and "appealing." Woot!